Director Sam Raimi’s film Darkman is a gritty look at humanity and revenge, with a main character who is transformed into something he never expects and doesn’t deserve, and yet must find a way to cope accordingly. Somewhat like a pulp comic, it is dark, serious, and thought-provoking. Ha ha, like hell it is. This is Raimi for God’s sake, and Darkman has all the three basic features you would expect: Stooges, Campbell, and The Car. But regardless of how ridiculous the movie was at times, the subject was still serious, and Raimi succeeded at making a new and creative dark superhero – well as long as you haven’t read Spawn. However, the game Darkman can’t seem to get past the Three Stooges angle. It takes all of the serious features found in the movie, spits in their face, and kicks them directly in the beanbag. Sadly this is not uncommon for movie-to-game translations of the period, but the game totally and disgustingly misses the entire point of the film, preferring to take the basic plot and apply it to a children’s game. Darkman has more in common with Super Mario World that with the movie it is based on. Rope balancing is one of the few unique challenges in the game. The vague plot of the game loosely parallels the move, in that Darkman (whom my spell-checker suggested should be “Dairyman”) must take revenge on the villains that created him by hunting them down one by one until he reaches their sinister boss Durant. The levels themselves are nauseating jokes, loyally following every overused “rule” of side-scrollers. 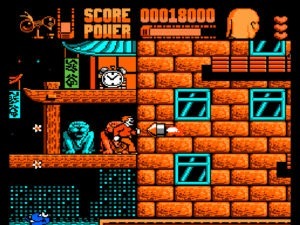 The best example is how in one level Darkman must track down his current quarry to exact his violent brand of revenge… and follows him into a “circus funhouse” complete with bouncing springs in the floor, floating balloons that kill in one hit, and evil clowns who throw pies in an attempt to stop our hero. The same is true for the random sawblades, giant piranhas, and rolling logs. 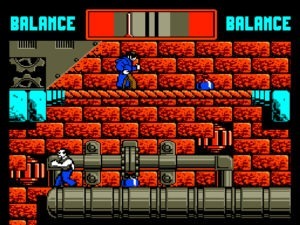 The story offered by the game promises that as Darkman, you must “control your rage” as you fight for revenge – fair enough as the movie often displayed Darkman’s explosions of rage and adrenaline. But do you really have to balance your anger? Nope. There is an unexplained meter in the corner of a pendulum-bird contraption that might be this rage meter, but it never moves. Having played through multiple levels I can honestly say that so far I have never had to figure out just what this meter displays. Another prevalent movie feature is Darkman’s ability to create masks and disguise himself as the villains. These disguises never seem to fool anyone, but do allow you to play as a slightly different character each level. You also get to enjoy a mini-game between each level which is essentially Hogan’s Alley with a camera as you try to take pictures of your current target to create said disguise, while men in windows shoot at you. Yet the crux of Darkman was that these masks only lasted a limited time, and I thought this too might be in the game as a time-limit or something to that effect. No such luck. There is a rotating mask icon but it too never changes and seems to just be graphical filler. Darkman's disguise doesn't fool Bullet Bill. Kids, from here on out, Darkman is a sorry, sorry game. Combat is the most pathetic I have seen in ANY game so far. You can swing at an enemy and do nothing whatsoever, while their punches freely injure you. This concept is hard to explain as it has never been so bad in any game I have seen before, but take my word for it. You can’t hit them but they can hit you. The only way you can hope to beat them is by leaping over them or socking them at the corner of a ledge, forcing them to fly off with a single lucky blow. Does this create some unintentional strategy? Yes, but it is not always possible, and a pathetic excuse to cover a fighting system that just flat-out doesn’t work. I fail to see how there is fun involved in a fighting side-scroller when you cannot fight. 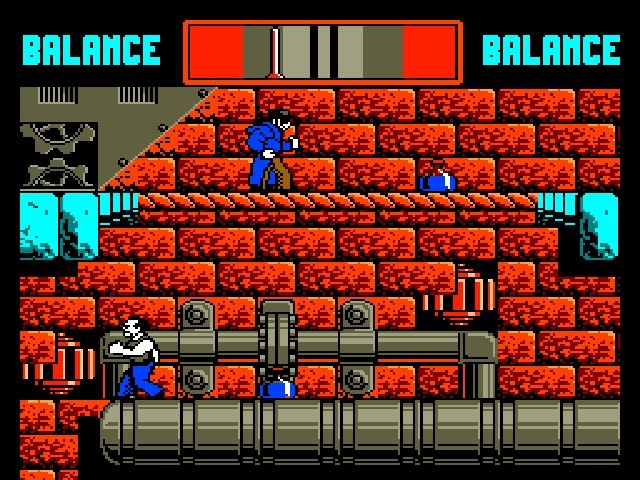 The controls further force me to “master my rage” as Darkman suffers from slippery shoes that slide a bit for no reason before stopping, and an inability to jump forward without first backing up and running forward. In a side scroller where fast and precision jumps are required, this lack of control is inexcusable. More fun that major surgery but certainly not something you’ll want to choose to be a part of, Darkman is a terrible choice out of thousands of other options. The levels are out of place and uninspired. The control makes the game more trouble to play than it is worth, and the graphics and sound are the usual fare. Out of all points, the controls ruin the game the most, and the difficulty and frequent deaths caused by these controls make chipping away at the levels through frequent use of the save state feature of an emulator the only way you can hope to win. There are much better games out there and this one doesn’t bring anything to the table to make it worth your time. Some elements of the movie are included. Uninspired and painful to control.